There isn’t a single theme that runs through my stories, or a shared set of characters. Some of my stories are humorous, others scary or deeply chilling. When I was trying to describe my work, I came up with the terms dark, funny and exciting - I hope everything I write has at least two of those qualities and sometimes all three. For me, the most important thing is that my writing makes you feel and makes you think. What you actually feel or think is up to you, my dear reader. Because without readers, what’s the point in writing anything? It’s no fun being a medieval princess, especially when your family treat you like dirt and force you to learn the most useless subject ever – magic. But what if there was a way you could harness that useless magic to get your revenge? 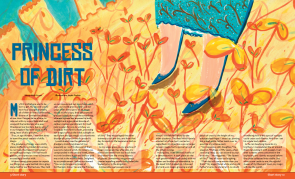 The explosive Princess of Dirt was originally published in the January 2014 issue of Stew Magazine. I've also written an article that goes behind the story of Princess of Dirt, and answers the question "Where do you get your ideas from?" Click here to read it. Mary is an eleven-year-old girl, forced to work down a coal mine from dawn till dusk. When a massive explosion rocks the mine, it seems that Mary will be trapped in the dark forever - until a mysterious visitor offers her a way out. But is she brave enough to leave behind everything she's ever known? 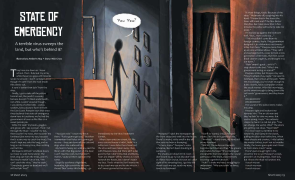 The thrilling tale of The Door Keeper was originally published in the March 2014 issue of Stew Magazine. 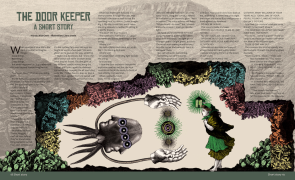 Discover how I went deep, deep underground to create The Door Keeper, as I take you Behind the Story. In the future, no-one will need to write, or type or even listen - everything will be beamed directly into our brains by advanced technology. So why would one boy break into the British Museum to write a letter on the very last typewriter in the world? 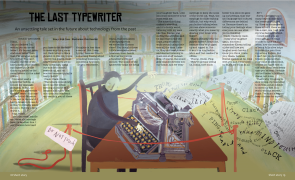 The intriguing tale of The Last Typewriter was originally published in the May 2014 issue of Stew Magazine, and went on to win the SCBWI Magazine Merit Award for fiction. Josh and Mia have run away from their parents to sit on a hill in London and watch the Greatest Show on Earth - the end of the world. But could the unthinkable really happen on such a beautiful summer's day? 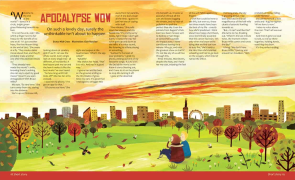 The funny, touching and chilling Apocalypse Wow was originally published in the July 2014 issue of Stew Magazine. 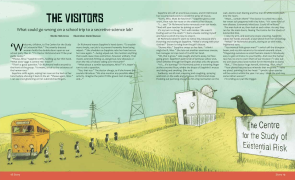 The Visitors was originally published in the September 2014 issue of Stew Magazine. We've all seen those little plastic bags stuck to the cover of nearly every kids comic or magazine. But where do all those free gifts come from? One boy takes an unexpected and chilling journey, eventually finding out a lot more than he wanted to know! 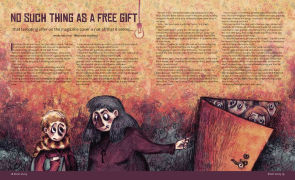 No Such Thing as a Free Gift was originally published in the November 2014 issue of Stew Magazine (and no, there was no free gift on the cover). Kayla is an African American girl caught up in a terrifying virus outbreak in Louisiana. The government have swooped in to declare a state of emergency, and the streets are full of soldiers. Despite all this, Kayla just wants a quiet life, until she discovers the real reason why the government are so worried about the virus epidemic. 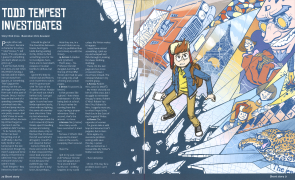 State of Emergency was originally published in the January 2015 issue of Stew Magazine. You can read all about the real world events that led to me writing State of Emergency on my blog. 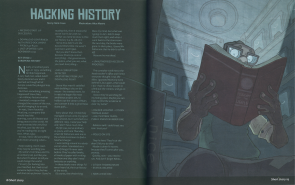 Hacking History was originally published in the May 2015 issue of Stew Magazine. 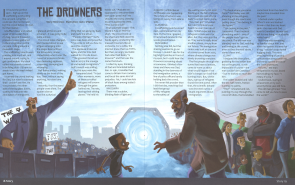 The Drowners was originally published in the August 2015 issue of Stew Magazine. 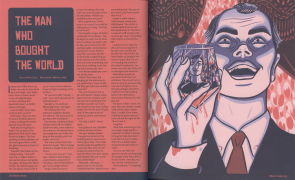 Todd Tempest Investigates was originally published in the December 2015 issue of Stew Magazine. 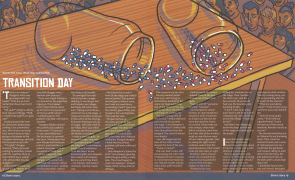 Transition Day was originally published in the April 2016 issue of Stew Magazine. The Man Who Bought the World was originally published in the June 2016 issue of Stew Magazine.